"These tacos are full of fresh vegetables and lime. They're quick and easy to make and they manage to be both healthy and very budget-friendly!" 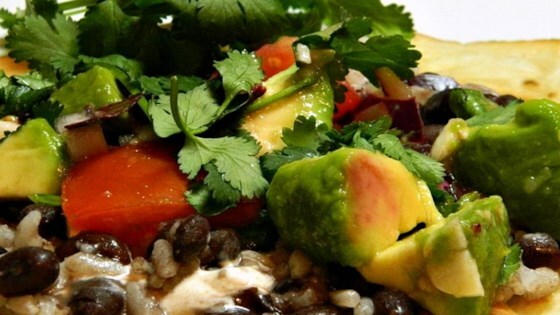 Mix tomatoes, avocados, onion, 1/4 cup cilantro, and garlic together in a bowl. Drizzle lime juice over tomato mixture; toss to coat. Heat vegetable oil in a skillet over medium heat. Arrange tortillas, 2 at a time, in hot oil; cook until crisp, about 1 minute per side. Remove tortillas using tongs and repeat with remaining tortillas. Spoon 2 tablespoons black beans and 2 tablespoons cooked rice onto each crisp tortilla; top with tomato mixture. Garnish tacos using remaining 2 tablespoons cilantro and green pepper sauce. This was a simple recipe with a big flavor. I used cherry tomatoes as they are sweeter and I like white corn tortillas. Cost was about $16 and it made enough for two people for lunch and supper. Loved this recipe. Made it just as the recipe called for. I will make this again. So, quick and easy to make. These were great! Light and tasty! Hubs said the only thing it needed was bacon.